Several stranding events involving white-sided dolphins were documented in the Gulf of St. Lawrence during the two first weeks of October by the Réseau québécois d’urgences pour les mammiféres marins and the Marine Animal Response Society. Over that period, multiple white-sided dolphins stranded alive on Anticosti Island (3 dolphins), Magdalen Islands (1 dolphin), Prince Edward Island (4 dolphins) and in Boyd’s Cove, NL (7 dolphins). Despite some attempts to push these dolphins back to the open water, most, if not all, died or had to be euthanized due to their poor condition. During the same period, single carcasses of white-sided dolphins were also documented on Anticosti Island and Northern New Brunswick. In addition, a group of 6 dolphins, including 2 calves, appeared to be unable to leave a shallow bay in Lamèque (New-Brunswick) for several days. These animals finally returned to the open sea following repeated interventions by fisheries officers from the Department of Fisheries and Oceans (DFO) and members of the Marine Animal Response Society. Based on the evaluation of pictures provided by witnesses, the stranded dolphins appeared to be in good body condition which suggests that their strandings were associated with acute processes such as an intoxication, acute infections or accidental strandings following navigation mishaps. Due to the remoteness of most stranding sites, only 3 of the dolphins that died were examined by a veterinary pathologist. The post-mortem examinations performed by Pierre-Yves Daoust, wildlife pathologist at the CWCH Atlantic regional center, confirmed that the examined dolphins were in good health before the stranding; infectious disease processes that could have accounted for these strandings were not detected. At this time, the main hypothesis to explain this unusual cluster of strandings of this species of dolphins is the occurrence of strong Northern winds associated with heavy sea that could have disoriented the dolphins in coastal water. According to Jack Lawson, Research Scientist at DFO, the strong weather associated with the passage of Hurricane Matthew in Newfoundland might have disoriented dolphins that were feeding on mackerel in the area at this time. There have been large influx of fish that dolphins are feed on, such as capelins and mackerels, nearshore this summer and fall. Dolphins feeding on these fish might spend an increase proportion of their time nearshore, which would increase the risk of navigation mishaps and strandings in heavy weather condition. The reason for this possible increase in abundance of fish prey nearshore late in the fall remains unclear but could be associated with the global changes that have been observed in the ecosystem of the Gulf over the last decade or so. 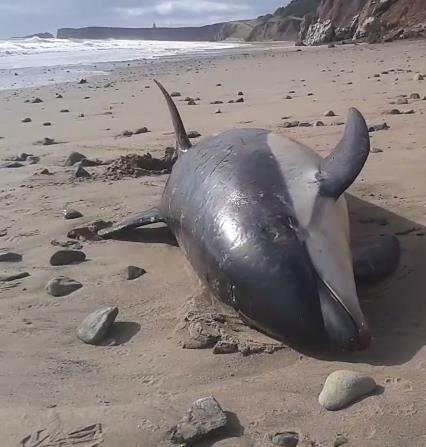 In order to support this hypothesis it will be essential to conduct full post-mortem examinations on a larger number of dolphin carcasses to rule out other potential causes of strandings.